There are several materials used in heavy duty diesel exhaust applications. Some of the materials are appropriate for heavy duty applications. Other choices are not durable at the temperatures generated by diesel engines, especially with new pollution control systems, and should be avoided to provide acceptable service life. Materials selected must not only survive high temperatures, but also withstand severe vibration, corrosive exhaust gasses, and external corroding agents such as salt and water. Is the preferred material for most heavy duty diesel applications. Aluminized Steel is a low carbon steel with a thin layer of aluminum alloyed to the surface. The aluminum provides galvanic protection for the base material. Aluminized Steel parts have an ultimate service temperature of 1250° F with a continuous duty temperature of 1100°F. This material has excellent corrosion resistance to acidic diesel exhaust gasses. Aluminized Steel parts provide excellent field life at a reasonable cost. Used for extended service life in diesel applications due to their higher operating temperatures. This material family provides slightly better strength at exhaust system temperatures than aluminized steel. 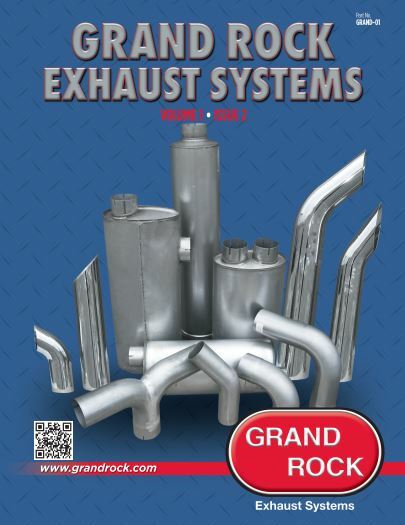 The most common 400 Series Steel that is used in exhaust applications is Type 409. It is stronger than aluminized but has cosmetic problems at exhaust system temperature. At first exposure to high temperature it discolors. Over time it develops a nondestructive coating of surface rust. After an extended time in the field a 409 product will display external discoloration and look worse than a similar aluminized part. Parts made with type 409 generally require some type of paint or other coating to slightly delay the onset of external discoloration. The parts will hold a magnet due to higher iron content. Another type is 409 Stainless Steel with an Aluminum coating. Aluminized 409 SS are used on Diesel Catalytic Converter mufflers due to its excellent high temperature resistance and the corrosion protection of the aluminized coating. This is a premium material found primarily on emission products or high temperature gas applications. durability, and service life. In general field service life with stainless steel flex pipe is very good if the flex tubing is installed properly. Galvanized Steel parts are sometimes used in the exhaust market. This material has an upper temperature limit of approximately 600°F. At temperatures greater than 600°F the material rapidly corrodes with a resulting degradation in appearance and probable failure. Galvanized Steel is often used for flex pipe as a low cost replacement part. The initial low cost is offset by the limited field life of the product. A very poor choice for any exhaust system part. This material is extremely susceptible to corrosion. These parts are only used when the lowest possible cost is desired. It is rare to find mufflers made of cold rolled steel, but there are stacks offered in some markets in Cold Rolled Steel. Clamps are another product commonly produced out of Cold Rolled Steel. Clamps are not exposed to the corrosive acids found in the exhaust gasses but the high temperatures cause clamps to degrade rapidly in appearance and in function. Cold Rolled Steel clamps can be very difficult to remove after a short time in the field. Exhaust systems. This material is a reasonable choice when a bright mirror finish is desired. Corrosion from the inside of the product can still occur; Chrome parts are very challenging to produce. We leave it to the experts at Metal Plate Polishing to get the job done right. They are a Midwestern USA company that stands behind thier finishe product. It is important to produce the parts with a high level of quality because surface irregularities and field damage to the surface will lead to external rust. An alternate choice for chrome parts is Bright Annealed Stainless Steel. This material provides a bright mirror like finish with excellent exhaust service life. The material is costly, but part of the cost increase is offset by using lighter gauges. Warranty coverage begins on the date and mileage that the part is purchased by the user and expires when the specified numbers of years or miles have passed, whichever comes first. In the rare event that a product does not perform as expected, Grand Rock warrants its products against failure due to defects in materials and workmanship for the period specified under Terms and Conditions for the particular part. Grand Rock obligation under this warranty covers replacement of the failed part including transportation charges. The Length of Warranty for replacement parts provided under warranty coverage is the balance of the warranty period remaining on the part being replaced. It is important that the customer handle, store and install all products properly. This warranty does not cover failure due to misapplication, misuse, abuse, neglect, rust through and corrosion (muffler), improper service practices or non-approved modification. If you have any questions about proper handling, storing or installation do not hesitate to contact Grand Rock.